An average skier going flat out may be travelling at up to 35 mph so it is important to wear the correct ski safety equipment which includes a proper ski helmet and ski boots. Take a tumble or hit another skier, tree or lift stanchion at that speed and things can get pretty nasty, so you need to use some common sense where ski safety is concerned. 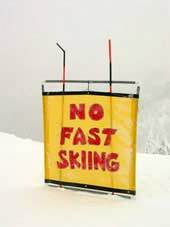 Indeed, in North America you can have your lift pass confiscated by radar gun wielding ski patrollers if you ski too fast or out of control - seriously! With any kind of lift pay attention when getting on and off or in and out. Watch you're not hit by the lift and don't get your skis, poles or loose clothing caught in anything. If you wear a rucksack you'll probably need to remove it before getting on a chairlift. T-bars and button lifts can be tricky enough to ride, but you also need to be aware that if you fall off you shouldn't attempt to grimly hold on to the lift and let it drag you up the hill on your belly. You'll never succeed and will probably end up leaving bits of kit strewn around and eventually falling off and maybe taking the skier behind with you. Once on the lift, don't muck about - you or another skier could potentially fall off a chair or out of a bubble/cable car. Also, on chairlifts be careful about messing around with gear such as poles, gloves and hats as it's easy to drop them. All of this ski safety equipment needs to be correctly used as well as making sure that your helmet and boots are in good condition. When you get to the top of any lift, ski off to the side so you don't get hit by the lift following behind you or another skier alighting from it. Before you hit the pistes, check your piste map to make sure you're skiing a run that you can cope with and that you'll end up at a lift that can get you back to where you want to be. Check that boots and bindings are secure, zips fastened (to prevent snow from getting where it shouldn't if you fall, or contents falling out) and no loose bits and pieces are dangling about. Once you're on the piste, it's your responsibility to remain in control and be able to stop or avoid other people or objects - remember that people ahead of you have the right of way. If you stop for a breather, ensure you're not obstructing a trail and are visible from above, and when starting downhill again look uphill and yield to any skier coming down. You should always observe signs and warnings along the trail, especially those warning of hazards and avalanche danger. And remember, ski safety takes on an entirely new dimension if you are skiing off piste. When you stop for lunch, don't be tempted to throw back the alcohol - drink as if you were driving and you should be ok to ski, and remember that alcohol dehydrates you and will also make you feel the cold more. And when you eventually end up back in the lift queue, keep life mellow for everyone by remaining polite and patient - even in France.